Teriyaki burger, actually comes from Japan, even though it sounds American. Teriyaki burger is made out of teriyaki chicken, hot dog buns and lettuce. 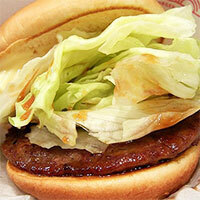 The given ingredients suggest that teriyaki burger is a good source of folic acid, vitamin K, and Selenium. Folic acid helps a body create new cells faster, vitamin K prevents blood clotting and selenium is helping GPO (glutathione peroxidases) enzymes protect our body from oxidative stress. Even though Teriyaki burger has all these vitamins inside itself, it also has a high percentage of fat and carbohydrates which make it not suitable for a diet regime established for losing weight. It will satisfy your appetite, but, given the amount of fat included in it, it is recommended to include some other folic acid, vitamin K, and selenium-enriched meal in your diet. The calories in Teriyaki Burger per 192g(1 roll) is 468 calories. Teriyaki Burger is calculated to be 244Cal per 100 grams making 80Cal equivalent to 32.79g with 30.18g of mostly carbohydrates、27.49g of fat、21.12g of protein in 192g while being rich in vitamins and minerals such as Vitamin K and Selenium.